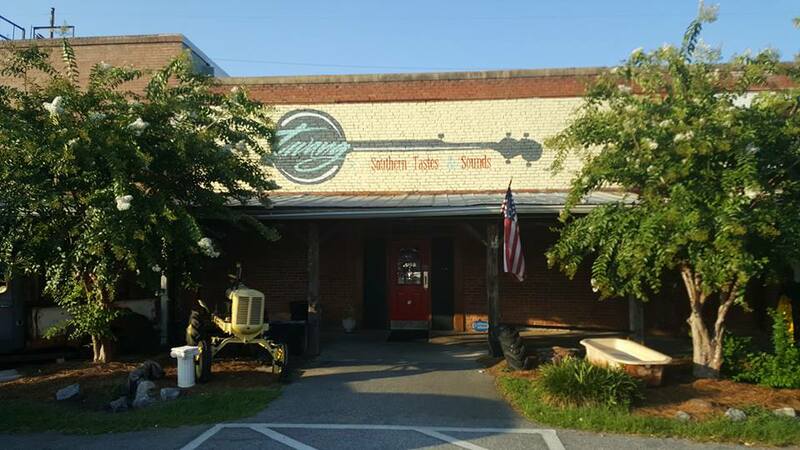 Exterior shot of Twang Southern Tastes and Sounds. Photo by Doug Deal. My wife and I are often on the lookout for new places to eat or for places that we might have missed in our 10 plus years living in Macon. It is always exciting to find another place to eat that has something deliciously different to offer, and Twang is such a place. As the name suggests, the restaurant puts a southern accent on its menu and comfort food abounds. 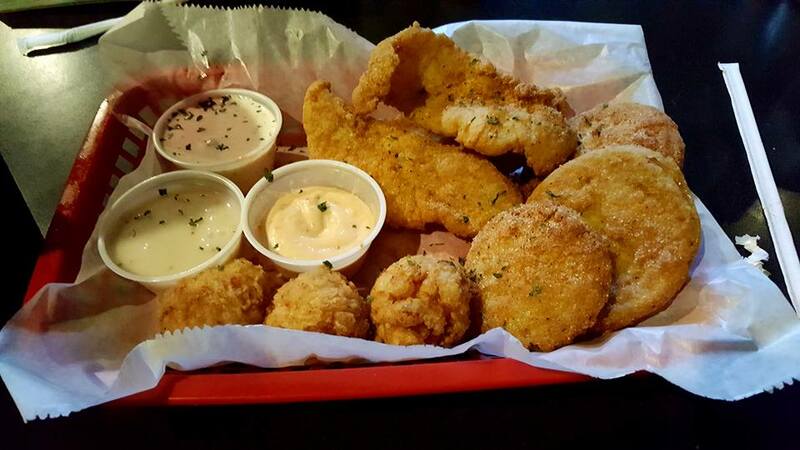 While deciding, we ordered and split the three appetizer sampler, which came with deep fried mac and cheese balls, friend green tomatoes and catfish fingers. This was served with three different sauces to match the nature of each app. 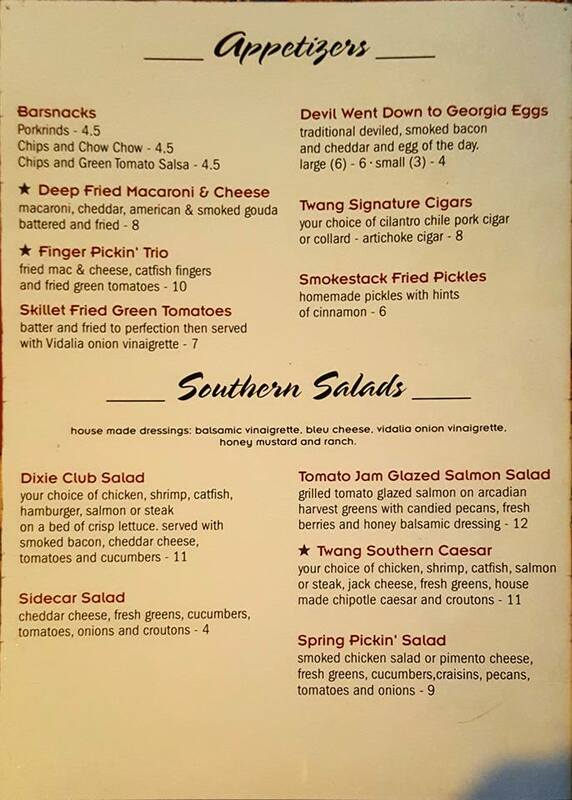 Twangs Finger Pickin’ Trio appetizer, fried green tomatoes, catfish fingers and mac and cheese balls. $10. Photo by Doug Deal. As for my meal, I had trouble deciding, but went with the chicken and waffles which I have not had since I lived in Atlanta over 12 years ago. The waffle reminded me of a slightly less sweet Belgian waffle than you might make at home. This was paired with fried chicken strips and a tasty syrup that I poured over the pile of food. The entree was served with a side and I chose to load up the carbs with smokey macaroni and cheese. The plate was way too much for me to eat, so I took approximately half of it home in a box for later. 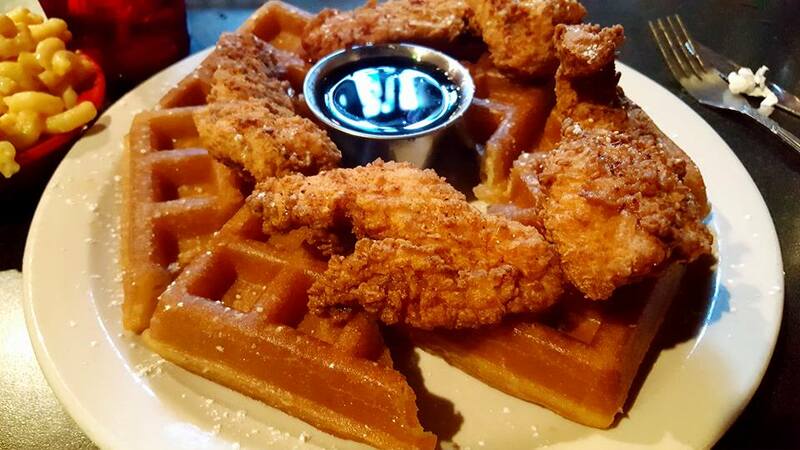 Twang’s Chicken and Waffle, served with one side and syrup. $14. Photo by Doug Deal. My wife got the catfish and paired it with beans and Gouda grits. My wife’s commentary was that they were “very Gouda”. She loved her catfish fingers and complained that she ate too much because they were too delicious to stop eating. The kids had the kid plates and at $5.50, it’s a pretty good deal. My son had the cheese quesadilla and my daughter had the hot dog. My son paired his with french fries and my daughter paired hers with the Gouda grits that she also thoroughly enjoyed. For the kids, the best part was the scoop of ice cream that comes with the kids meals. Both children finished every last bite. 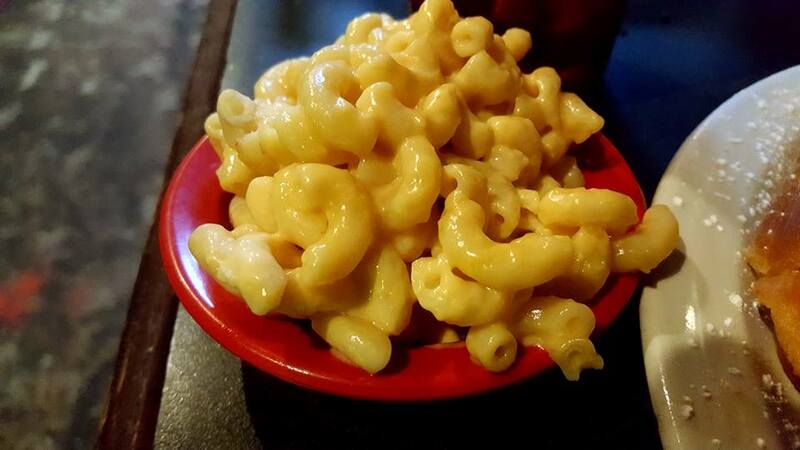 Twang’s Mac and Cheese. Photo by Doug Deal. Twang is an excellent restaurant, hidden in Payne City at 342 Rose Ave. It is worth the effort to find and if you go, be sure to check-in on Facebook. We had a wonderful welcome by the staff for doing so. Twang is open every day except Monday for lunch and dinner, closing at 9PM most days but open later on the weekends. More information can be found at their website. 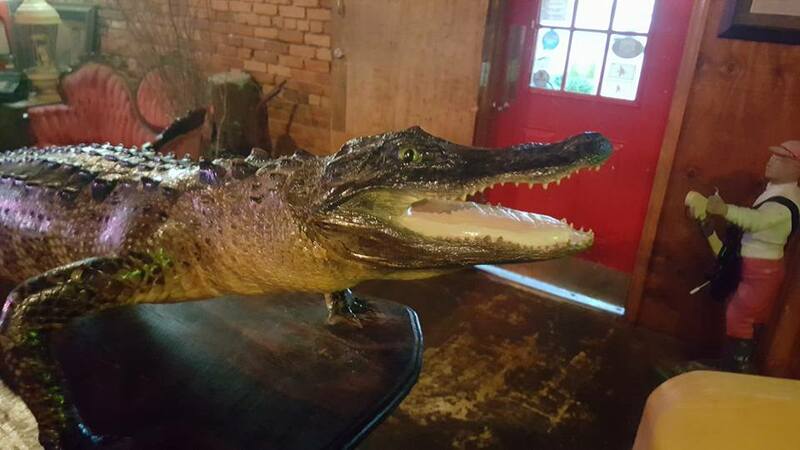 The country and southern decor are plentiful at Twang. Photo by Doug Deal. 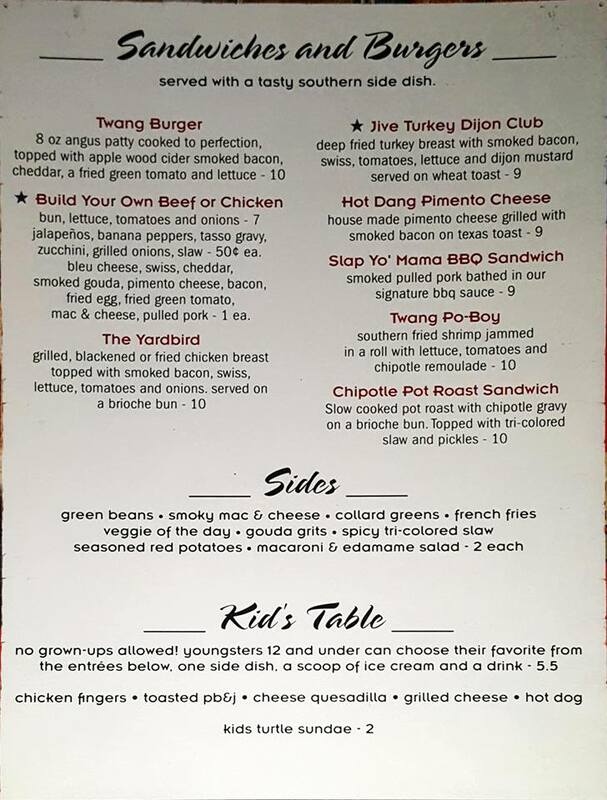 Page one of Twang’s menu. Photo by Doug Deal. Page two of Twang’s menu. Photo by Doug Deal. 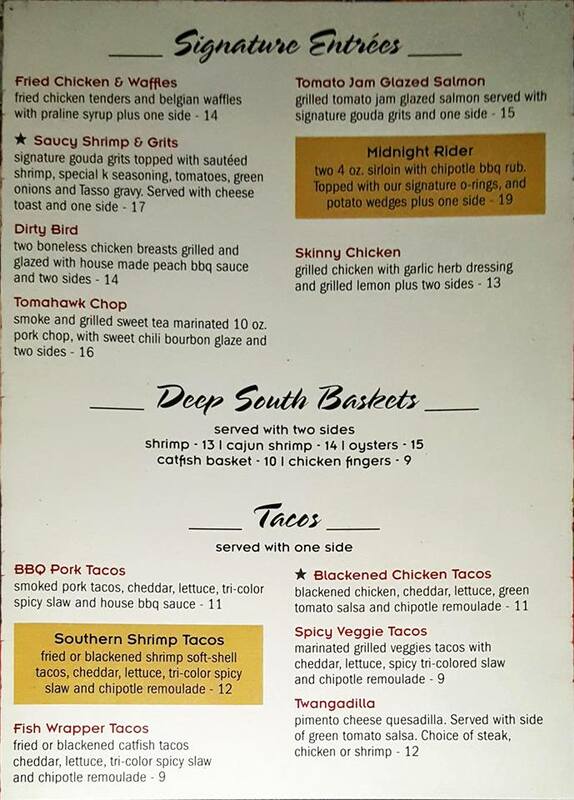 Page three of Twang’s menu. Photo by Doug Deal.